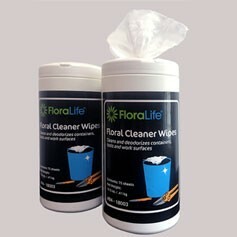 Ready-to-use Cleaning Wipes for floral tables, tools, buckets, cooler walls and more. Ready-to-use Cleaning and deodorizing cloth wipe for floral buckets, tools, work surfaces, vases, containers, coolers, as well as shipping and packing areas. Flower wellness brings customer satisfaction and repeat flower sales to your business. Use as a general purpose wipe for efficient cleaning. Clean to reduce the plugging up of flower stems, which reduces water uptake. Improve flower life as a result of a cleaner environment.